Biocon’s partnered biosimilar, pegfilgrastim, Fulphila, received approval from the U.S. FDA last month. Biocon’s partner, Mylan, has launched the product in the U.S. as the most -- as a more affordable therapy option for cancer patients undergoing chemotherapy. Biocon's sterile drug product manufacturing facility for biologics in Bengaluru received EIR from U.S. FDA and the EU GMP certification during the quarter. Biocon presented PK-PD data on our Novel Insulin Tregopil at the American Diabetes Association scientific sessions in the U.S. And Syngene extended and expanded their agreement with the Baxter global R&D center until 2024. Total consolidated revenue for the quarter were INR 1,193 crores, up 21% compared to last year. Revenue from operations were INR 1,124 crores, which were up 20% as compared to last year. This includes licensing income of INR 5 crores this quarter as compared to INR 8 crores in Q1 of last year. Small Molecules, the segment revenue was up 10% to INR 400 crores. Biologics grew 36% to INR 250 crores and Branded Formulations grew 13% to INR 147 crores. Syngene revenues were up 39% at INR 406 crores in Q1. 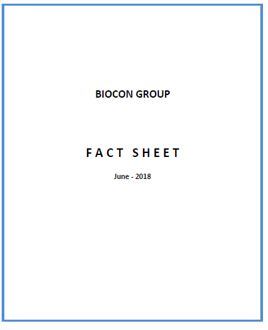 Biocon incurred gross spend of INR 88 crores on R&D this quarter, corresponding to 12% of revenues, excluding Syngene.Of this amount, INR 44 crores is reported in the P&L. Biocon capitalized an amount of approximately INR 44 crores related to our biosimilars and insulin analog development expenses. The gross spends are lower than last year due to timing of some of the activities on a quarterly basis. The amount in the P&L has reduced on account of capitalization of bevacizumab-related expenses, which were reflected in the P&L in Q1 of last year. Biocon booked a Forex gain of INR 39 crores this quarter as compared to INR 17 crores in Q1 of last year. This gain is reflected in the other income line of the P&L. Of the total amount, INR 28 crores is coming from Biocon while the rest is attributable to Syngene. Group EBITDA grew 25% to INR 307 crores, with EBITDA margins at 26%. 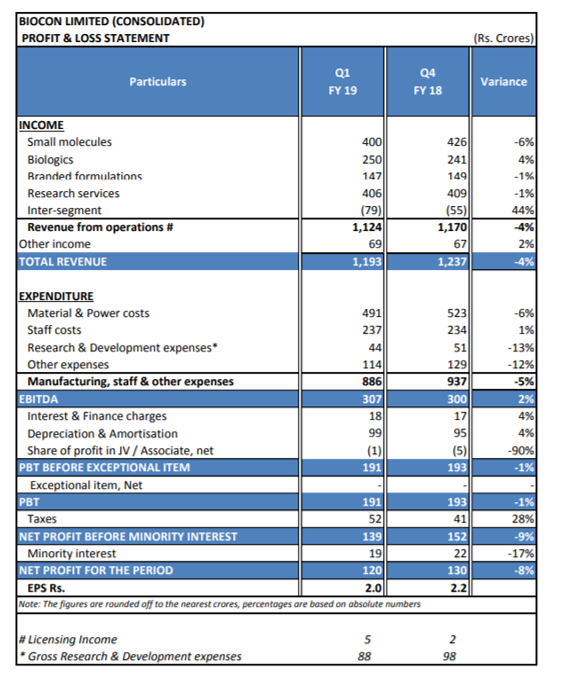 Core margins, that is EBITDA margins net of licensing impact of ForEx and R&D, stood at 27%. Reported net profits were up 47% this quarter at INR 120 crores, which represents a net profit margin of 10%. The effective tax rate at 27% for the quarter is slightly lower than last year of 28% due to lower losses in overseas subsidiaries during the period under review. The revenue growth of this segment was led by key APIs and increased generic formulation sales. Higher sales of immuno-suppressants and increased market share of Rosuvastatin formulation in the U.S. were key contributors. Biocon also launched simvastatin tablets in the U.S. market during the quarter. The recent launch of pegfilgrastim by Biocon’s partner, Mylan, in the U.S. and Insulin Glargine sales in EU and Australia, which are planned for later this fiscal, are expected to provide a further tailwind to this segment performance. Biocon is confident of achieving the $200 million target revenue for this segment in FY '19. In Q1, the growth in Branded Formulations segment, which comprises product sales in India and U.A.E, was led by growth in the India Branded Formulations business. The India business growth this quarter benefited from the lower base last year in the same quarter due to GST implementation. Metabolics, Nephrology, Immunotherapy and Comprehensive Care divisions aided the business performance with strong growth reported for some of our key brands. In the U.A.E., the business continue to garner market share in the Metabolics segment to increase sale of in-licensed products of Insulin Glargine, which was introduced recently. In terms of research services, Syngene recorded a strong growth this quarter. The growth was driven by good performances within biologics manufacturing, discovery services and chem dev services. Syngene also announced the extension and expansion of their agreement with the Baxter global R&D center until 2024. They also announced the recommissioning of Phase I of the upgraded [S2] facility, which was damaged due to a fire incident in December 2016. The progress made provides good visibility on underlying growth expectations for Syngene for this year and the long term. In Europe, the regulatory review of Biocon’s Marketing Authorization Applications or MAA for biosimilar trastuzumab and pegfilgrastim are progressing well, and the decision by CHMP is expected by the end of calendar year 2018. For the U.S. market, Biocon and Mylan are generating additional clinical data for Insulin Glargine in support of the manufacturing site change from Bengaluru to Malaysia. As part of Biocon’s novel molecule portfolio development program for Insulin Tregopil, our oral insulin candidate. Insulin Tregopil advanced in pivotal Phase II, Phase III study in Type II diabetes with more patients in India being randomized during the quarter. Biocon able to increase sales in the Small Molecules segment despite challenges persisting in the generics industry. Branded Formulations also grew in double digits, and a better performance expected from this segment this year. The growth segments, namely Biologics and Syngene, have made a strong start building upon the traction from last quarter. Recent and upcoming launches of biosimilars, coupled with traction in the research services, provide us a good launch pad to accelerate growth in the subsequent quarters during this financial year.